An oft-cited study states that there’s a gap of 17 years between research findings and practical implementation. Although the study in question is about medicine, many fields experience a significant lag time between research and practice. Wilfrid Laurier University’s Student-Community Research Partnerships for Social Justice and Wellbeing (SCRP) is different. The eight-month research internship program, which is jointly run by Laurier’s Centre for Community Research Learning and Action (CCRLA) and the Laurier Students’ Public Interest Research Group (LSPIRG), gets students involved in research that community organizations can – and often do – use right away. “The program gives students an opportunity to develop hands-on research skills as well as learn more about community-based research through the experience of designing and conducting a study with a community partner,” says Catherine Gormley, one of the 18 students involved in the 2016/17 program, which earns senior undergraduate students 1.0 course credit. “You’re making a meaningful and practical impact,” says Andriana Vinnitchok, who also participated in the program. Gormley, Vinnitchok and fellow students Chelsea Brown and Theresa Irving were in a group working on a research project for Christian Horizons, a not-for-profit organization that serves people with developmental disabilities. Theirs was one of four groups working with different organizations on community-based research projects. The four community organizations gave the student groups a general sense of their research needs. The students then designed and conducted studies to meet the stated goals. Christian Horizons seeks to provide holistic support to its clients – but it wanted to better understand exactly what “holistic support” means both to its staff and the people being supported. This was the research question Brown, Gormley, Irving and Vinnitchok started with. 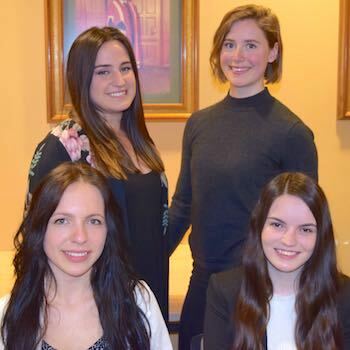 The student groups spend the first half of the research internship completing training workshops, designing their research projects and going through Laurier’s Research Ethics Board approval process. In addition to meetings with Christian Horizons, Brown, Gormley, Irving and Vinnitchok’s group met weekly with Courtney Arseneau, a student in Laurier’s Community Psychology PhD program, who acted as the group’s advisor. After going through the organization’s volunteer training, the students spent some time getting to know people supported by Christian Horizons in Waterloo Region. The experience was “invaluable to the research process,” says Vinnitchok, who is returning in September for a fifth and final year in psychology. “Learning about the organization is completely different than meeting the people whose lives are supported by what Christian Horizons does,” says Gormley, who has just finished her BA, also in psychology. The experience allowed the students to understand how the organization worked and to create personal connections that would enable them to recruit study participants. During the second half of the program, the group interviewed eight people receiving Christian Horizons supports and six staff members, called direct support professionals. The questions explored facets of holistic support, including mental, physical, and spiritual health; the promotion of independence; intellectual stimulation; social connections; and personal growth. The students analyzed the interviews to write their report. The report suggests indicators that could help determine if individuals are being holistically supported. However, the students caution that many factors are interdependent. “When we set out to do the research, we thought there were going to be explicit indicators that someone is being supported holistically,” says Vinnitchok. “What we actually learned through the interviews is that holistic support is an outcome of a very dynamic and active process of providing support. Vinnitchok and Brown presented the methods and findings of their research at a major conference in Toronto in early June. Gormley and Vinnitchok say the research internship helped them confirm that they want to go on to do more community-based research, probably through graduate programs in the future.